Part of the Ranch Range, comfortable and stylish seating, eye catching design and generously proportioned. These sets are a ‘wow’ factor for any patio. Our signature rounded corners are standard on all the table and benches in this range. The Ranch 8 is the most popular size in this range, a really beautifully shaper square table, the rounded corners really add to the sociable design of the set. The table is well proportioned and with 4 benches surrounding it this set is ideal for families and friends to gather around. Part of the Ranch Range, comfortable and stylish seating, eye catching design and generously proportioned. These sets are a ‘wow’ factor for any patio. Our signature rounded corners are standard on all the table and benches in this range. The Ranch 4 is a nicely sized set which will easily seat 4 adults, with a rectangular table and 2 meter long benches, theres enough space for smaller families or occasional guests. We have now extended our popular range of Heavy Duty Picnic Benches to include a massive 12FT/3.6M version. We also do this item in an extra wide version with a 5 slat top instead of 4 – if you require an extra wide version, please give us a call on 07969 787208. Usually sold with our free standing tables, our 1 metre benches are the perfect solution for additional seating for an existing table or for placing in a sunny corner. Will comfortably seat 2 adults. Part of the Ranch Range, comfortable and stylish seating, eye catching design and generously proportioned. These sets are a ‘wow’ factor for any patio. Our signature rounded corners are standard on all the table and benches in this range. The Ranch 12 is incredible in size, seating 12 adults with room to spare this set is an eye catching arrangement that will be a great centre piece for summer barbeques and garden parties. Part of the Ranch Range, comfortable and stylish seating, eye catching design and generously proportioned. These sets are a ‘wow’ factor for any patio. Our signature rounded corners are standard on all the table and benches in this range. The Ranch 16, we doubt you have ever seen a table on this scale especially not at such an affordable price. The biggest set in our range is stunning, room for 16 adults and more the set spans 16ft x 8ft. If like us you enjoy nothing better than spending long evenings surrounded by friends and family then this set will not disappoint. Our most popular product, these tables are great value for money. Perfect for the garden but heavy duty enough for use in public spaces. The tables all have rounded corners on the table tops and benches, which not only gives them a look and feel of quality, it makes them safer by eliminating sharp corners. Each table has a 50mm parasol hole for sunny days (although we can build them without should you wish). The picnic tables come in 3 standard sizes but can be built to any size from 3ft 6” all the way up to 12ft which will comfortably seat 16 adults. The 4ft seats 4 adults comfortably. Our most popular product, these tables are great value for money. Perfect for the garden but heavy duty enough for use in public spaces. The tables all have rounded corners on the table tops and benches, which not only gives them a look and feel of quality, it makes them safer by eliminating sharp corners. Each table has a 50mm parasol hole for sunny days (although we can build them without should you wish). The picnic tables come in 3 standard sizes but can be built to any size from 3ft 6” all the way up to 12ft which will comfortably seat 16 adults. The 5ft seats 6 adults without any trouble. 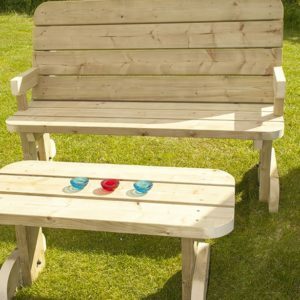 In the same style as our table benches these chairs are great value for money and would be ideal for the end of a picnic table or for your perfect little corner of the garden. Our most popular product, these tables are great value for money. Perfect for the garden but heavy duty enough for use in public spaces. The tables all have rounded corners on the table tops and benches, which not only gives them a look and feel of quality, it makes them safer by eliminating sharp corners. Each table has a 50mm parasol hole for sunny days (although we can build them without should you wish). 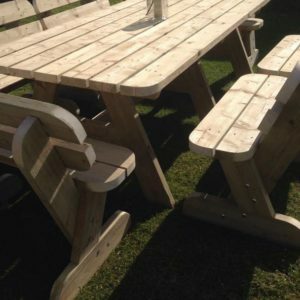 The picnic tables come in 3 standard sizes but can be built to any size from 3ft 6” all the way up to 12ft which will comfortably seat 16 adults. The 6ft allows seating for 8 adults without any trouble.